Moolamurthy gives darshan with eight hands (Ashtabuja) and Eight aayudhas(Weapons) and hence the name Ashatabujakaram. On the right hand are Chakra, Knife, Pushpa and Arrow and on the left are Shanka, Bow, Gada(Mace) and Khadga. Sarpa which came to kill Nrisimha saw Ashtabujanathan and surrendered to Vishnu. As per the orders by Vishnu, Shiva (Serpent) guards the yagna sala to this day in the form of Sarabesan. The Lord came at the call of Aadimoola and saved the Elephant (Gajendra) who was caught by Crocodile while plucking Lotus flowers for the Lord . Access to the temple Very near to the Hudsonpet, Chinna Conjeevaram. 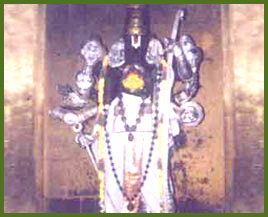 The Moolavar of this Sthalam is Sri Aadikesava Perumal. Other names are Gajendravaradhan, Chakrathaarar. Moolavar in standing position facing West direction. Prathyaksham for Gajendran, an Elephant. It is believed that only in this sthalam, Gajendra Moksham happened. This temple is situated in Tirunelveli district in Tamil Nadu. 1 1/2 kms away from Sri Vaikundam railway lane, this sthalam is This sthalam is also found in Kanchipuram (chinna or little kanchipuram) and is situated about 2 Kms from Sri Varadharajar Temple. Lots of bus facilities are available from Big Kanchipuram. It is very close to Yathothakaari Temple.